When I was 15 years old I got polio, which brought quite severe damage to my arms and shoulders. Nevertheless, it has worked well throughout my career in the engineering industry. I have worked as a project manager, worked as CEO and have been used to caring for myself. Approximately seven years ago I realized the difficulty it became to eat. Having to be fed affected my independence and self-esteem too much. Because I was not alone in this problem, I sought for a good assistive aid but didn’t find anything that suited my needs. So I started to think of different solutions and had a feasibility study done by Ann-Louise Lindborg (formerly Norén) who did her thesis at Chalmers. We started with a detailed specification of requirements, which we followed during development. Ann-Louise and I got a first prototype together, and when we had a solution in principle, we went into a fruitful collaboration with Robotdalen in Västerås, Sweden. Through their networks we were given access to the capacity that we needed to establish a good product and design. We also received significant amounts of support in word and deed of Promobilia, Create and the Assistive Technology institute during development. 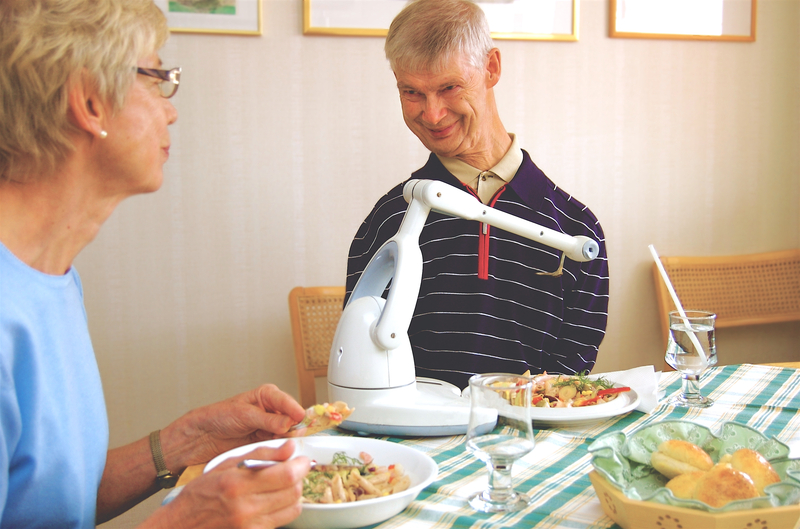 I wanted to see if it was possible to eat independently even if one has low function in their hands and arms. To make something that both works well and feels good. The result is Bestic.